These look amazing! Oh to have the time to prepare the foods I see on this blog! These look amazing. I love the variety of decoration! I can be accidentally romantic too :D. I’ve not been single on valentine’s for three years :P. To be honest, Valentine’s isn’t big on my calendar either, it’s just an excuse for a little extra marketing and money making – but it’s nice to celebrate it to some degree, I suppose. Great post, dusty. Yum! Dark chocolate and sprinkles – how can you go wrong! These look absolutely fantastic. I love everything about them, from your ingredients to the cuteness of them as well. Wow. Of course, I also adore Valentines day, so I’m a bit sappier than normal for the cuteness factor. Have a fabulous day! Why thank you! I love when I accidentally make adorably cute things considering I am NOT very crafty. And now they’re boxed in little red boxes and bags and I’m feeling VERY girly ;) I hope you have a fabulous day too! Beautiful Truffles:) Thanks for sharing! Also, what brand of food colorings do you use? It’s been hard here to find gluten free ones. Not at dumb question at all – it was from a former recipe, adapted from the Milk Bar Cookbooks (it’s linked to in this recipe). It’s a loose cheesecake that pipes easily. I use Wilton coloring gels, which don’t contain gluten products (not in a dedicated facility but I’m lucky not to have the fierce restrictions). Hey girl, I’m not a sucker for V Day, but I’m a total sucker for romance – unplanned, unexpected, utterly gooey romance. I loved reading your post! 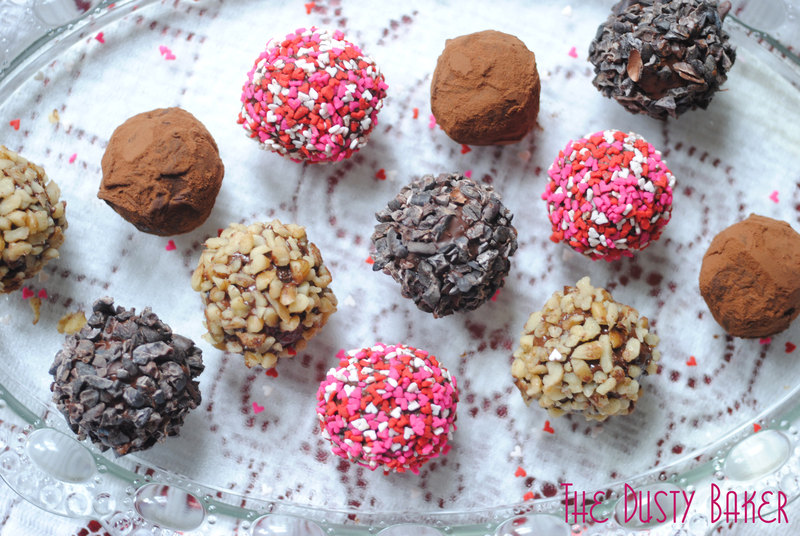 Your truffles look delicious – I have been nervous about making cake truffles as I am not the most graceful person when it comes to melting chocolate…or covering things with melted chocolate and making it look good. From one romantic to another, your truffles look gorgeous and I hope you have a wonderful week! I must say I got gooey romancey making these… even if was an affair only with my camera (literally had to be “you have enough pictures, Jacqueline!!). You should have seen my kitchen – chocolate and bowls of gooeyness everywhere to the point that I think I shocked my roommmate, who’s seen me at my worst :) Happy week to you too! Hubs and I have been married 20 years this year and are utterly unromantic. If he does the dishes or takes the dog out for me I am content. Lol. We’ve never been into V-Day, to me it’s just all about retail. Which I think is sad. Not that I am opposed to retail. But on my own terms. These truffles look wicked good. I would gladly eat a gazillion of these. I was hoping we would get another Ruark story…but no. That’s ok because these truffles look so very divine. I wish I had seen them sooner so that I could prepare them for tomorrow. I love truffles, the ones with just ganache, the ones with ganache and some liqueur mixed in, the cake truffle kinds (I agree carrot cake truffles are absolute heaven). Yours look so pretty! These are extremely pretty and mmmmmm can I imagine the glorious creaminess! Those looks fantastic, I especially love those in cocoa powder! You did wonderful job sweetie!